It’s a good thing that I like rainy weather! It is still raining here. It’s been raining for weeks. Even though it’s raining, I’ve been enjoying sitting outside in my spare time under our mostly dry gazebo/tent thingy and visiting with my pets. I love to take out a parrot or two to play on the rocking chair, and of course Penny, my cockatiel and constant companion. 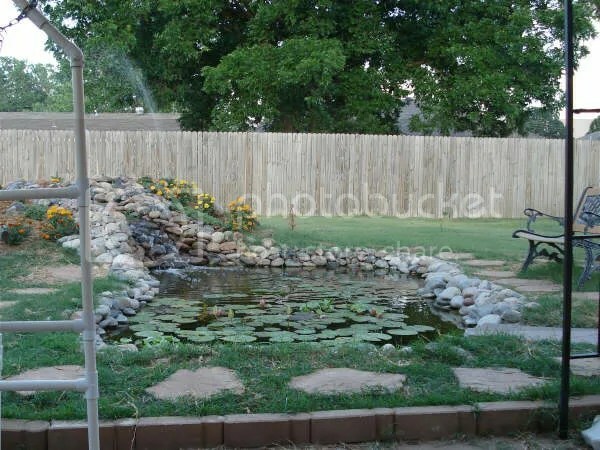 From my gazebo, I can watch the fish in the pond, watch my two box turtles wander around, watch the wild birds come to the pond, and of course play with my dogs and bunnies. I have a pen that I’ve set up for the bunnies so they have a safe place away from the dogs (just in case). I only give the doggies supervised visitation with the bunnies. They are nice dogs, but I am a worry wart. (Just ask my hubby!) When I’m outside, I let the bunnies out of their pen so that they can romp all around the backyard. The bunnies love to hop up the hill that our waterfall comes down from. If you were four inches tall, you would love hills too! They also love to run laps around the pond. They even love to play in the rain. The bunnies are not afraid of the dogs at all, so they don’t run away from them. In fact, the bunnies hop right up to the dogs and lay down near them in the gazebo sometimes. When the bunnies are finished romping, they go back into their own yard, lay under their hutch, and take a nap, then I close their gate. "If I ever go looking for my heart’s desire again, I won’t look any further than my own back yard." Of course, when my hubby comes home from work, I’d rather spend time with him, but until he gets home, I spend my time after work in my own backyard…..